Thank you for your interest in one of Quality Auto Center's online offerings. 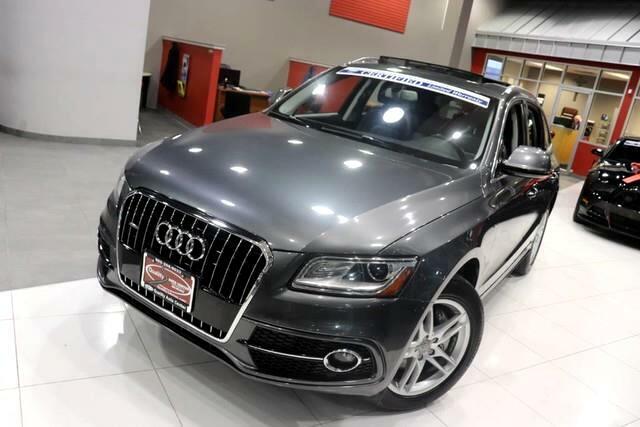 Please continue for more information regarding this 2016 Audi Q5 Premium Plus with 24,252mi. The Audi Q5 is the benchmark all other SUVs strive to meet. With exceptional power, towing and handling, this SUV can handle anything thrown at it. Sophistication & understated luxury comes standard on this Audi Q5 Premium Plus. Well-known by many, the Q5 has become a household name in the realm of quality and prestige. This vehicle has an added performance bonus: AWD. It improves handling on those winding back roads, and gives you added safety and control when driving through wet and snow weather conditions. The Q5 Premium Plus is well maintained and has just 24,252mi. This low amount of miles makes this vehicle incomparable to the competition. More information about the 2016 Audi Q5: With the 2.0 TFSI engine and 8-speed automatic, the 2016 Audi Q5 performs similarly to its V6-equipped big brother while being much more fuel-efficient. The standard Q5 has an EPA highway rating of 27 mpg. The Q5 has the longest wheelbase in its class and that gives it an especially smooth, settled ride. With either 3.0L V6, the Q5 has an excellent towing capacity as well. The Q5's rear-biased quattro all-wheel drive system brings more driving enjoyment than is typical in an SUV this size, while the interior has just as much versatility and flexibility as other utility vehicles in this class. Add to the mix a 2.0L hybrid -- or even the potent SQ5 -- and the appeal of the Audi Q5 is hard to ignore. Strengths of this model include excellent towing capability, available Audi Drive Select customization, excellent ride quality, strong safety feature content, hybrid fuel economy, and Strong performance No Credit / Bad Credit / No Paystubs, No problem !! ! All Approved ! Everyone drives ! CLEAN, GORGEOUS, LOW MILES, SHOWROOM CONDITION. CALL NOW QUALITY CERTIFIED up to 10 YEARS 100,000 MILE WARRANTY , To Certify a vehicle, there will be an additional cost for Certification. CALL NOW For details. STUNNING AGGRESSIVE LOOK ON THIS BEAUTIFUL--Call today to schedule a test drive... Good Credit/Bad Credit/No problem!!!! Get paid cash? No problem!! 100% Credit Approval with interest rates starting at 2.49% for qualified customers, our rates will not be beaten. We price our cars at wholesale price to guarantee the best deals for our customers. Our inventory moves quick, please call to confirm the availability of the vehicle of your interest Springfield location 973-564-0112. This vehicle is located at our SPRINGFIELD location. Come visit our new showroom in Springfield NJ.